Navratri is a festival which dedicated to the worship of the Hindu Goddess Durga. The word Navratri consist two words NAVA+RATRI, first word NAVA means nine (9) and second word RATRI means nights. Navratri is the occasion when Hindu devotees worship nine Roops (forms) of the Goddess (Devi) during nine nights. The tenth day is known as Vijayadashami or Dussehra. This is the day when nine days long fasting ends. Vijaydashmi is also known as Satya ki Asatya par jeet (Truth wins over Lie). This is the day when people fire effigy of the Ravan and his family members. Hindu devotees celebrate this day with sweets, different types of dishes. 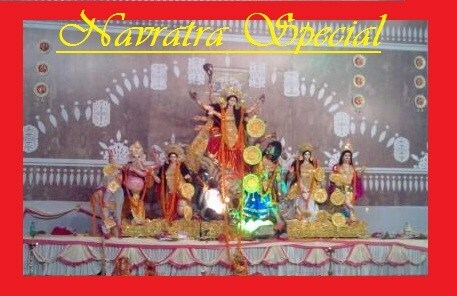 In India a long festive season starts with Navratri, till Diwali a long festivity. Navratri is having special importance in Hindu Methodology. Devote observe fast during these Nine days. I am trying to give you a glimpse. Sharadiya Navratra starts after Pitra Paksha. People use to clean their homes. My in-laws have special Mandir (temple) Room. They prefers special cleaning as well as painting of walls. New dress offered to the Goddess. In Navratri, we wake up early in the morning for preparation of puja (worship) and rituals. My Mother grows barley seeds in a pot during the period of nine-day. 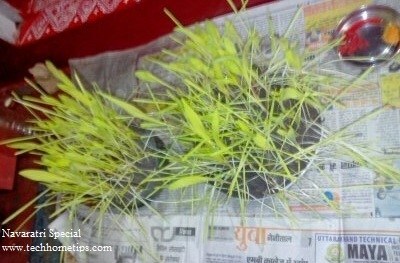 My mother and mother-in-law, both do Kanya Pooja (Kanjak) on the 8th day of Navratri. Generally I have seen that young 8 or 9 girls below 12 years preferred for Kanya bhoj. Some of my family friends do Kanjak on the 7th or 9th day of Navratri. Kanjak considered Devi Roop so devote who do fast invites girls called Kanjak in their homes. My mil use to wash their feet and then put Tilak on their forehead. Some people Wrap a small red chunri on their head too. She then offers them Halwa, Puri, Nariyal, Chana in new plates as Prasad. She also gives them some gift . In Navratri many Hindu devotees take fast (Vrat). Some do all the nine days fasting. Some do only first or last day. Fruits and sweets are offered to the Devi Durga. As I told you above in my post, people do fast in Navaratri. During fasting people eat only one time, in the evening or night after worship of the Goddess. Devotees who observed fast avoid Onion, Garlic and salt (they use only Rock Salt which is called Sendha Namak too). A list of the ingredients, which you can eat during Fast. In my family other Flours and Spices are not used during fasting. Onion and Garlic is strictly prohibited. In my family Pulses too are not considered for Fast observer. Here is the list of recipes that you can try this Navratri. A Disclaimer: The information above shared is on the basis of my family tradition, as well as from the information gathered from my friends. Information can differ according beliefs of the different community and region. If you have any doubts about the information given above, please consult your Priest (Purohit or Panditji). Happy Navratri to all of you. May the Goddess bring prosperity in your family.